Has anyone ever discourage you? I'm gonna guess yes, just for the simple fact that you are alive. Discouragement is part of life but it is not fun. Today I want to tell you that you should welcome discouragers into your life. They're inevitable, so by welcoming them, you and I can become stronger. Discouragers are everywhere. I've been discouraged to stay at home with my kids. I've been discouraged to wake up early and exercise. I've been discouraged to spend time with God. 5 years ago I was discouraged to run in Houston. Little did I know that Houston would be the place where I would become a marathoner. I didn't refute the discouragers but I didn't affirm them either. I just let their words fall in the soil of my heart as fertilizers do. The fact is, discouragers are the fertilizers to your dreams. Don't look at them with hate and disgust. Look at them as a way for your dream to grow faster. That's what fertilizers do. When added to good soil they bring optimal growth. God created fertilizers to enhance the growth of plants. Fertilizers increase the capacity of a plant to produce new steams, flowers or fruit. The speed of that growth is enhanced by fertilizers. Without fertilizers, there's no optimal growth. 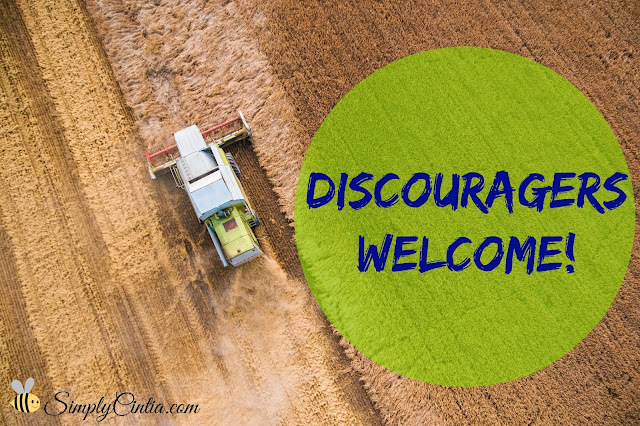 Without processing discouragement properly, there's no optimal growth. The decision to forgive the discourager means that you are planting the fertilizer in the soil of your heart. The decision not to forgive, means that the fertilizer is still in your hands. If you know anything about organic fertilizers, you know they smell awful. Your hands, clothes and hair will smell like cow poop mixed with spoiled food. That disgusting smell is the scent of unforgiveness. Decide today to let go of the offense by forgiving my friend. That fertilizer will go straight into the soil of your heart and God will make sure that it will all work out for your good. Keep on dreaming and achieving. I have learned that there are more encouragers out there than discouragers. I have learned to let negative words quickly fall into the ground as I release them through total forgiveness. Your dreams will come true as your character will match the greatness that God has placed inside of you. It just takes a little patience with the fertilizing process. "Haven't I commanded you? Strength! Courage! Don't be timid; don't get discouraged. God, your God, is with you every step you take."